A nourishing Summertime salad that combines crunch and tang. Kids love it just as much as adults! Trim ends off 1 cup fresh green beans and cut in thirds. Place in a medium saucepan with 2″ boiling water and cook for 3 minutes. When done, drain hot water, and cover with cold water and some ice. Set aside. In medium-sized bowl add the apples, celery, cucumber, and red onion. Gently mix together. 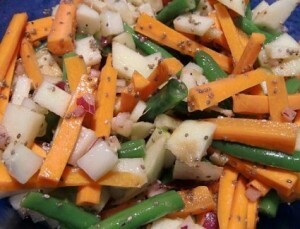 Add the green beans and carrots and stir to mix. In small bowl, mix together the sesame oil, chia seeds, and lemon juice. Drizzle juice mixture over green apple mixture and stir to coat evenly. Nourishing Treasures was founded in 2006 by Lea Harris, just a mom passionate about her family’s health and well-being. Lea is now a Certified Health Coach graduate from Beyond Organic University. Encouraging others to take baby steps in the right direction of health for their families, Lea believes education is power, and an ounce of prevention is worth a pound of cure.